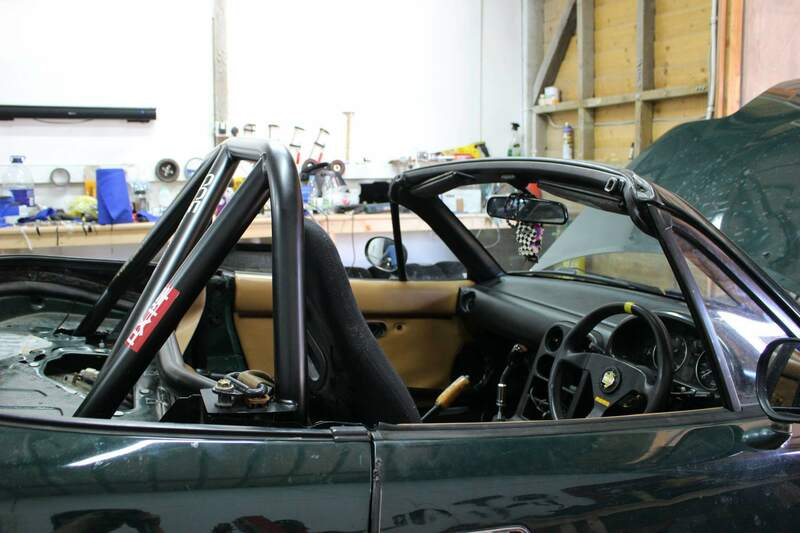 Home › Guides › Your MX-5 Is Floppy, Here’s How To Stiffen It Up. With the crash of the peril it really highlighted the need for a roll bar and frankly not just any roll bar. I’d want the biggest, widest one I could get my hands on to make sure if anything like that happened again both myself and my passenger would be safe. The TR Lane GPV did its job. But even on the wet mud it managed to buckle with the impact and frankly wasn’t far off failing completely – I honestly don’t think it would have fared well if the hit was on tarmac or concrete. So, the choice was made to look at GC Fabs, Winston already had a GCR2 installed and we all admired how well designed it was – taking into consideration the fact that if you are very tall the bar does come a little close to comfort to your head but there are ways around this if you’re below 6ft this shouldn’t be a problem at all. 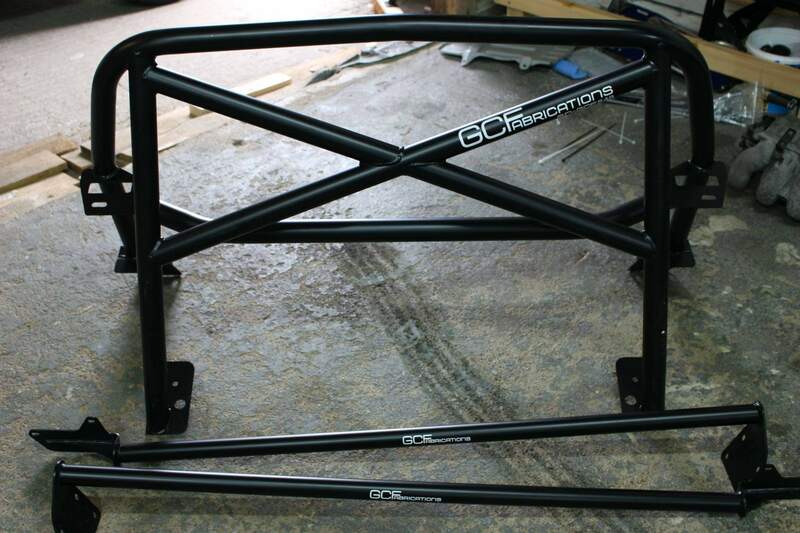 A less race spec bar is also available made from the same material using the same processes with the GCF range of roll bars, very comparable to TR Lane in their design but wider and feel more substantial, they are also built to MSA specification and can therefore be used for competition if you see fit. Now, this isn’t supposed to be an advert for these bars or GC Fab, frankly it’s just designed to tell you that rollovers can happen and the MX5 / Miata is really not designed to handle that kind of situation in the slightest – as I’d said previously the more people running a roll bar in my book – the better. We are now running 3 cars with basically the same suspension and chassis modifications, we like it this way because it becomes our own little ‘Spec BOFI’ setup and let’s us compare our driving skill at the track rather than talk about minor differences that make them perform better. With that in mind, let’s talk about the chassis setup on the cars themselves and the reasoning behind the chosen parts. We’ve done a blog post previously about running Skidnation frame Rails and while much of the evidence for them is anecdotal and some of the benefits are more about protecting your chassis rails from sausage kerbs, speedhumps etc they do add what we would call ‘comfort’ and deal with some of the vibrations in the car and settle the suspension overall. The roll bar itself adds rigidity across the chassis but that doesn’t make a huge noticeable difference in overall performance – certainly the car feels more substantial and it adds a huge comfort factor which may allow you to improve your lap times just due to that fact. The main winner here is the door bars, they are absolutely night and day when it comes to installation and they bolt to existing holes in the chassis and the mounting plates for the GCR roll bar, this triangulates the front of the vehicle to the rear and you immediately tell the difference jacking up the car or even in our case, the first 3 feet moving it on the gravel outside of our unit. Frankly, if you have a bucket seat like our much loved Motamec MRX it doesn’t even intrude on your experience as the bar is the same height as the seat bolster – if anything it helps you get in. The chassis rails improve the bottom of the box, making it less able to deflect in and out, adding a level of improvement to the overall chassis rigidity which as we’ve said before, you can really feel. The roll bar adds stiffness left to right on the rear of the car, making it even more important to run a front strut brace to keep the front in check as the forces in cornering try to twist the chassis rather than the suspension. The door bars make the biggest difference front to rear – where the main problem is – because they triangulate the front to the rear, massively resisting the twist of the chassis as it tries to tweak up and down due to the fact it doesn’t have a bloody roof. With all these in place, the only way its going to get better is seam welding the whole thing and then throwing a full BRSCC spec cage at it but frankly, for road use and track this is an excellent starting point – inputs are direct and responsive. The GCFAB Bars are all bolt in, they come with spreader plates which you must install and are generally pretty easy to install – its just a measure twice drill once affair. The GCR range of bars bolt to the back of the rear bulkhead which is massively strong and unlike the GCF / TR Lane style of bar you’d need a very serious hit to sheer that whole section or force the bar to buckle. The door bars themselves bolt straight up to the holes you drilled for the rollbar and then into 2 factory bolts to the right of the throttle pedal – as easy as it gets. The effort to benefit ratio is through the roof! The first thing you’ll notice is when you drop the car back down the way it moves under the jack is very different to what you’ll be used to and this is on a half way decent car that isn’t rusty and buggered. The second thing you’ll notice is the way the car moves under power and even at slow speeds, if there was a night and day way of demonstrating stiffness door bars are it. With the car now happy to stop tweaking up and down in the middle with the help of the frame rails and the door bars we can expect that the front of the car which is basically long boxes above each wheel will be tweaking out of position. They need to be stabilised with a proper strut brace. These will further support the front suspension and stop it tweaking up and down under hard cornering, with all the other bracing it would be interesting to see the impact these have. The anti-roll bar bracket will be the next thing to start to move, these actually bend inwards due to the force of an aftermarket bar and it’s highly recommended when you start doing track work. If you car already has the SVT package or in general has the ladder brace at the rear it’s in a good place to start with as that further ties the rear subframe to the chassis. Adding further bracing to the front subframe helps keep everything in place. This one is pretty extreme, filling all the gaps that the factory left with their spot welding process and adding in further strength to the shell. A huge job with respect to prep and paint afterwards, generally reserved for stripped out track cars. We generally consider our ‘SPEC BOFI’ setup to be one of the best bang for buck builds you can do, with respect to protection, rigidity and power. It’s hopefully something if you emulate, can let you hack around on track for lap after lap without too much fuss.